The exciting thing about an anthology series is that you never know what the next episode will bring. The daunting thing about an anthology series is that you never know what the next episode will bring. Mark and Jay Duplass’ Room 104 mitigates that crap shoot with a single guarantee: No matter the director, no matter the premise, every episode of Room 104 will take place in the same nondescript room of the same unnamed motel. It’s something new for one of the oldest forms of TV there is (though it must be said that David Lynch did it first, and for HBO, to boot): endless possibilities between four plain-looking walls. Nonetheless, the grab bag nature of the anthology format is in full effect: Of the six episodes HBO made available to critics, one is truly great, two are good, two are middling, and one is a fascinating mess. Unfortunately for our common associations with anthology TV, one of the “middling”s and the “fascinating mess” spring from Room 104’s dabblings in genre. From The Twilight Zone and Alfred Hitchcock Presents to Tales From The Crypt and Black Mirror, this type of show has always lent itself to suspense, screams, and the supernatural, none of which seem to come naturally to Room 104. With the exception of Todd’s televisual interjections, “The Knockadoo” plays out between Luqmaan-Harris and Jones; the majority of “Ralphie” consists of Melonie Diaz interacting with young Ethan Kent. These episodes are, in stage parlance, “two-handers,” and they’re not the only part of Room 104 that contains a trace of the theatrical. In fact, that’s most of what works about the series: With its intimacy, emphasis on performance, and intent to continually transform the most spartan of scenery, it’s a show that rewards anything that makes the titular location feel like a black box. (In this sense, the series reaches past the heyday of The Twilight Zone and into the televised plays of live, golden age anthologies like Playhouse 90 and Studio One.) In “The Internet” and “My Love,” respectively, Karan Soni and Philip Baker Hall captivate with what are essentially episode-length monologues, as the former attempts to retrieve an important document from a misplaced laptop (over the phone, in the dial-up days of 1997) and the latter spills his guts to the wife he first slept with in room 104. The absolute best Room 104 has to offer is a theatrical experience in and of itself, a new-wave dream ballet written and directed by Guggenheim fellow Dayna Hanson in which a housekeeper (Dendrie Taylor) relives a painful memory through movement and moody lighting—and eventually a pas de deux with her younger self (Sarah Hay). A later installment in which two mixed martial arts fighters treat room 104 as their own personal octagon hits harder with its camerawork, but it’s Hanson’s episode that proves just how much space there is to move around the twin beds and dressers. 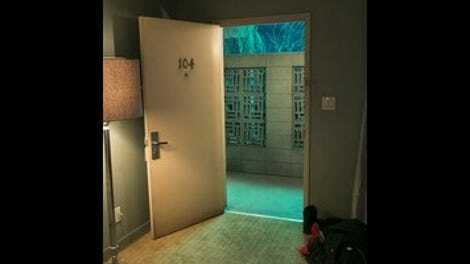 As the fantasia unfolds, the appeal of tuning in to Room 104 and not knowing what you’re going to get really sinks in. The idea of someone flipping by and getting sucked into this expertly staged, artfully edited experiment in the middle of a late-night lull is even more exciting.